Get a taste of the countryside when visiting Amsterdam. Cycling is the Dutch way to travel and the simplest excursion is to rent a bike, take the train for a 15 minute ride west to Haarlem and then cycle through town. You will eventually be meandering into the country side. Just west of Haarlem is Zuid-Kennemerland National Park, which is about 15 square miles of forest, dunes and beach. Biking around the country will bring you into small rural villages which can be a nice rest stop in their own right. 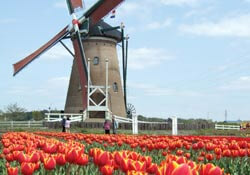 Tulips and windmills are two other great days out from Amsterdam. In springtime, the tulip fields west of Amsterdam are a fantastic sight. Keukenhof, near the old town of Lisse, is the largest flower garden in the world. It is a huge park (run by the Dutch flower industry and with an industrial sized admissions charge to go with it, but impressive enough) and it is open to the public from the end of March through mid-May. Buses travel to the site from the two nearby towns of Leiden and Haarlem, that are easily reached by taking a train from Amsterdam. Freelance touring of tulip fields by bike is another option. In fact, a ride through the countryside between the cities of Haarlem and Leiden should bring you into a colorful world of flowers. Tulips, in stripes of all colors, give the fields a surreal feeling. Again, the flowers only bloom seasonally, so spring between April and May is the only time to visit. The same region in the summer is prime beach territory. The area which covers the tulip fields and nearby coastline is commonly called Duin en Bollenststreek (the Dune and Bulb Region). Huge sand dunes and beaches run along the entire Dutch coast. The best known resort here is Noordwijk aan Zee. To reach Noordwijk aan Zee, take a train from Amsterdam to Leiden or Voorhout for an easy trip. If you want to learn more about the history of tulips and Holland, visit the Tulip Museum in Amsterdam during your visit. If it's windmills you seek, then look no further than Zaanse Schans. This village is about 20 minutes from Amsterdam by train. The area is something of an outdoor museum, with old Dutch homes, shops and many traditional windmills. The first Albert Heign is here as well (a Dutch supermarket chain, this landmark would be comparable to say the first McDonald’s or Hershey factory, but Dutch). Last updated by jack on 06 July, 2008 in Travel.